Wyoming fossils was the first science art collaboration of SLA. We continue to work together informally are design glass fossil art for sale and exhibitions so contact us for more information. We are scientists and an artist that have begun a collaboration. We have created artwork that brings life to the amazing fossils Wyoming has. Fossils and bugs merge with concrete, glass, metal, paper, photography and sculpture. This collaboration received a kick start by receiving the Art grant by the Biodiversity Institute at the University of Wyoming. If you want to get involved, look for our Facebook page “Science Loves Art”, Instagram “science.loves.art” or blog/website. It would be awesome to connect with your class or community. Dr. Ellen Currano is a palaeobotanist and assistant professor at UWyo who uses fossil plants from Wyoming and East Africa to study the response of ancient forests to environmental change. She is also co-founder and scientific consultant for The Bearded Lady Project: Challenging the Face of Science (http://thebeardedladyproject.com/). She loves all outdoor activities and Star Wars. Her favorite color is orange. Dr. Cynthia Weinig is an ecological geneticist and professor at University of Wyoming. 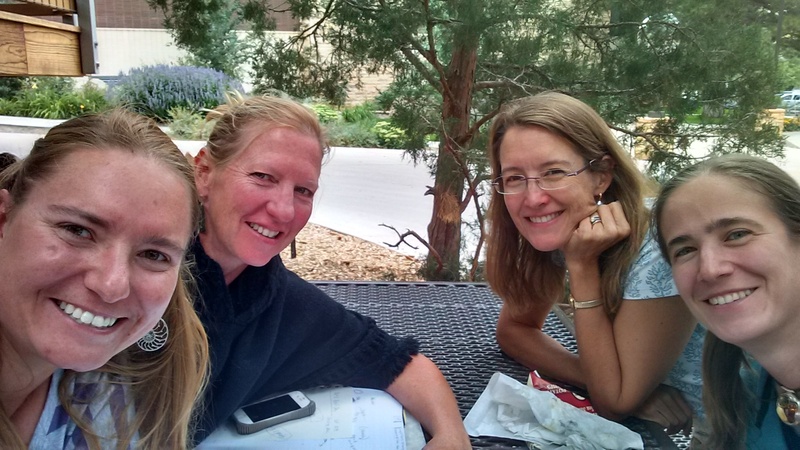 She is interested in how plants adapt to stress in natural and agricultural settings, and works with plant species native to WY as well as crop species. She enjoys doing art with her Science Loves Art friends, and doing everything outside in WY! Her favorite color is purple. Meredith Pratt is the Coordinator at the Williams Conservatory, University of Wyoming where she enjoys educating both children and adults on different plant species from around the world. She recently launched her own small succulent business, Succy Designs! She enjoys hiking with her dog Emmylou, and her favorite color is orange. Laura Vietti is the University of Wyoming Geological Museum collections manager where she enjoys educating school groups and the public about Wyoming’s world-class fossils and geology. Laura’s favorite activities include rock/fossil collecting, soaking in hot springs, and her favorite color is teal.